Students from all over the country had visited IFHS. You may notice that some of the students on this page are now providers of IFHS. Please read their experience with Iliuliuk Family and Health Services, Inc., and the City of Unalaska. From the moment I entered Iliuliuk Family and Health Services (IFHS) Clinic, I was greeted with some of the most diversely skilled, friendly, and welcoming staff that I have encountered to date. Over the course of my visit I was able to experience a variety of medical emergencies, a substantial amount of chronic disease management, and cultural diversity exposure that is unparalleled by any of my other rotations. Although I found it difficult to leave the clinic at the end of the day for fear of missing a unique case, I still found the time to gorge myself on king crab, explore, beach comb, pull crab pots, gape at the landscape, run from bald eagles, bond with fellow students, and rally the Rav 4 car up Summers Bay Road. I will undoubtedly be returning to Unalaska as I have yet to partake in the countless other activities that can only be dreamed of elsewhere. Most importantly, I have yet to see the feral horses. I am so thrilled for (and jealous of) all the future students who have yet to experience their IFHS rotation. I first learned about IFHS after reading an article in 2010 in the AAPA magazine that highlighted the small but famous Alaskan town and the unique medicine practiced there. When the opportunity arose to complete a rural outpatient rotation in Unalaska, I jumped at the chance and re-read the tattered article I had been hanging on to. Having already spent several years in Alaska, I felt prepared but wasn’t completely sure what to expect on my first trip to the Aleutians and Bering Sea. The moment I arrived I fell in love with the tight-knit community, the diverse population behind the powerhouse fishing industry, the crazy weather, the breathtaking views, and the endless list of potential outdoor adventures. The amazing clinic staff was warm, welcoming, and they made me feel instantly at home. This rotation is as much about medicine as it is about immersion in the community. Performing sports physicals at the high school, hosting a spot on the public-access television station, and attending the Annual USAFV Soup-Off Fundraiser were particular highlights of mine. It was easy to make friends and to find someone to hike with after work, explore beaches, or come by for dinner. This is a truly unique rotation, not only will you have the opportunity to see a mix of family practice, urgent care, and emergency medicine while in clinic but you will experience what it means to be a part of and make a difference in a rural Alaskan community. My rotation in Unalaska/Dutch Harbor was unforgettable. I had such a wonderful experience with the staff, the community, and the amazing scenery the Island had to offer. The clinic of Iliuliuk Family and Health Services provided me with the opportunity to strengthen my skills as a clinician by working with a great group of providers and staff. Everyone had so much to offer in the way of teaching, and kindness abounded from all. I felt very comfortable in the clinic and enjoyed the variety of personalities that provided for a fun and humorous learning environment. Furthermore, I had to opportunity to care for patients in the general family medicine setting in addition to medical emergencies, all of which required unique considerations on this remote Island. The community is another highlight of this wonderful adventure. The people are friendly and there are many community events that allowed me as a student get to know the people and issues they face. I had the opportunity to attend community education events, participate as a host on the local TV channel, attend gym classes at the PCR with other locals, speak with the fishermen, and attend information sessions about the sea life! 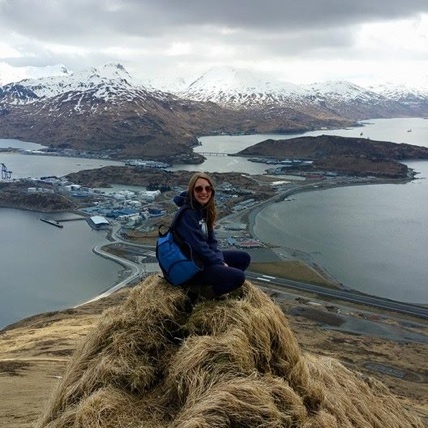 Dutch Harbor/Unalaska also offers beautiful scenery and hikes for adventurers of all levels. The views at the end of each trail are breathtaking, and the journey there offers endless opportunities to enjoy nature. Even in April/May I saw wildlife of all sorts; I saw numerous birds, sea otters, feral horses, and foxes in addition to the bald eagles that are everywhere. You also cannot miss the WWII relics all throughout the island. I am very thankful for the many opportunities this rotation provided me on my journey to becoming a Physician Assistant both in and out of the clinic. I am certainly bettered by the experience and have gained skills that I will take with me throughout my career. My best experiences in clinic were during after-hours "emergencies" when there was only a preceptor, an MA, and a student. In these situations you have to do things from scratch, like start IVs while thinking medically about what comes next. The whole process start to finish depends on just a few people, which allowed me see the big picture and made me think critically about what steps in patient care come next. I feel like I also got good experience assessing "sick vs not sick." My other best experiences: generally the ethnic and cultural diversity of both the patients and the support staff of the clinic, since this taught me about different cultural attitudes toward health and healthcare; the passion of all the providers at the clinic for providing care to a community that really needs it while working long hours; the opportunity to see an MD who used to be a PA and is also now an acupuncturist in action -- this is not the type of provider you get to work with every day, and I was really impressed. Outside of clinic, I got to go on informal tours of catcher/processor and processor boats which were crucial in helping me understand the working conditions of many of the patients, and the tours were really interesting and fun. My suggestions for other rotating students/residents: take advantage of opportunities when they come even if they seem like they'll be awkward or weird, or you're tired, or it's windy, or something. When not working, the long days of sunlight allowed for me to take long hikes and jogs after work and on weekends, really getting a feel for the landscape, which I loved; and it was fun to see the providers outside of clinic too, and participate in community events like an EMS/fire department training and the USAFV soup-off! I spent the last four weeks of my clinical rotation year as a PA student from Des Moines University in Des Moines, Iowa at IFHS in Unalaska during April-May 2015! If only I could fit into this short testimonial all of the unforgettable experiences I had during my time here, I would…but I will do my best! My rotation at IFHS was one of the most memorable clinical sites from my 12 months of rotations. This clinic not only provides family medicine experience, but also exposes students to emergency and urgent care scenarios (including many orthopedic injuries acquired through the fishing industry). Due to its remote Aleutian Island location, this rotation taught me to practice medicine without the many “technologies” that are commonly relied on today. With the nearest specialty physicians, inpatient hospital, and advanced imaging located in Anchorage, working at IFHS taught me as a provider how to deliver quality patient care without relying on these resources that were so far away! The population here, due to the varied popular industries, is quite diverse providing a great experience to care for international patients or those who have traveled here temporarily for work. Outside of the clinic setting, Unalaska provided me with an equally amazing experience! Every day here was so refreshing with many breathtaking views of the surrounding mountains and seas. For those who enjoy hiking or nature in general, there are many different trails to explore as well whether it is the steep 1,634 foot climb up the face of Mt. Ballyhoo, a leisurely walk out on the spit into the bay, or a longer, daytime hike to the other side of the mountains! During my many, many hours spent outside enjoying nature, I was able to see countless bald eagles, sea otters, various bird species, feral horses, and even a fox peeking out at me at the top of Mt. Ballyhoo! In addition to hiking, there are many other things to do such as visit the fishing vessels on the pier, enjoy a seafood buffet at the Grand Aleutian Hotel, visit the local museums, and explore old WWII bunkers and fort remnants scattered throughout the town. Overall, there is something for every type of person to do and enjoy here! Another great part about this rotation was having another student/roommate from a different PA school around the country here with me! It was great to meet a new friend to enjoy all of these experiences and adventures alongside with! My experience at IFHS and my four weeks exploring and becoming a part of the Unalaska community is one that I will never forget and always hold very fond memories of for many years to come! I am so thankful for the opportunities I was given during my stay in the Unalaska community and the multitude of experiences I gained here that helped me grow both professionally and personally! I know from my own experience and from those that came before me, the future clinical students at IFHS are very lucky individuals with an unforgettable memory awaiting them! My experience out here in Dutch Harbor/Unalaska has been great, both in and out of the clinic, and it was certainly more than I expected. As many other students have noted before me, the patient population is amazingly diverse, so you can consider this an international experience as well as an underserved/rural experience. What's more, if your timing is right and you come here during one of the busy fishing seasons, you can expect to get your fill of emergency medicine. In all cases and at all times, your skills and knowledge will be challenged, and the "limitations" of practicing medicine out here will turn into learning opportunities. You will get great hands on experience in the full scope of urgent & emergent care, and you will quickly learn or improve your ability to differentiate "sick" from "not sick." One of the best things about the clinic here is that you are integrated into the provider team, and you progressively have more responsibility as your rotation goes on! You will get called in by the on-call provider for any interesting cases that come in after hours. And you will get ample access to and training on how to use their electronic health record, which in turn allows you to improve on your lab & x-ray interpretation. The support staff is amazing, extremely open and friendly, and they all work well with students. The environment here is very collaborative and team-based, and the focus is entirely on providing the best care possible for the patients (no big egos here!). This rotation is ideal for students who are ready to hit the ground running, but not recommended for your first clinical rotation. Be forewarned, when you come experience IFHS, you might not want to leave! As for my experience outside of the clinic, I was again pleasantly surprised. If you like the outdoors and have a sense of adventure, you will enjoy your time here. This is a year-round hiker's paradise, and if you come during the right time of year, birders will love it too. Of course, the fishing is unmatched, and the clinic makes a real effort to get you out on a boat, if you're interested. The clinic also makes it a priority to integrate you into the community, and they stress how important this integration is for them personally and for any healthcare provider in a rural setting. You will get personally guided hiking tours, and/or a tour of one of the fish processing facilities, just so you can appreciate the working conditions of many of your patients, and there is a very good chance that you will get a chance to host a program on the local radio or television station, which is a lot more fun than it sounds! You might get to help out with the school sports physicals, and you'll see how great the local schools are, not to mention the local recreational facilities and the pool. Just like the clinic, this community will start to draw you in! Finally, a few words on the accommodations...the clinic has bent over backwards to provide adequate housing and transportation. The house is in "downtown" Unalaska, walking distance to the clinic, over a pretty little foot bridge, often under the watchful eyes of a few eagles. You can also walk to the gym/recreation center and pool, as well as one of the tastiest eateries on island. On bad weather days, you can drive the clinic-provided SUV to the clinic (I've heard they're replacing the RAV4 with a Jeep, fancy! ), and there is a well-stocked Safeway grocery store over on the Dutch Harbor side, not far from the rest of the eating establishments and bars. The house has WiFi (dial-up speeds) and cable TV, as well as all the utensils and cooking implements that you need, including coffee maker and mugs. There is a washer & dryer in the house, along with sheets and pillows for the beds, but you may want to bring your own. The only thing the house is missing is a vacuum cleaner, but you can borrow one from the clinic. Make sure you hike Ballyhoo mountain over by the airport at least once, and try to get to one of the museums so you can appreciate the rich history and culture of these islands. Good luck, have fun, and make the most of your time here! I had a wonderful time at IFHS clinic during my four week clerkship for PA school!! Out of all of my clinical rotations, IFHS was the best clinical site in Alaska, hands down. The entire staff is world class, highly diverse and extremely friendly. I have never felt more welcomed and included in an organization and or community than in Unalaska. I am so thankful to have had the chance to learn from and work with such an incredible team of healthcare workers. IFHS is more than just another clinic site, it is an all encompassing life experience, I learned so much and made so many new friends. My preceptors offered an excellent balance of guidance and autonomy during my training.They not only cared about my development as a student but also as a person. With their guidance I was able to put all of the pieces of medicine I have learned throughout my training together here at IFHS, and for that I will be forever grateful. I can only hope to one day become a medical provider such as those I had the privilege to work with at IFHS. Thanks for the life lessons and I hope our paths cross again. My name is Jake Runyan and I was a PA student at Idaho State University in Pocatello, ID when I traveled to Unalaska for a clinical rotation in late spring of 2013. I spent 5 weeks at the Iliuliuk Family Health Services Clinic and loved every minute of it! I was able to see a side of medicine most people are never able to experience, as well as do some amazing sight seeing, hiking, and fishing. From the minute I stepped foot in the clinic and began meeting all of the staff, I felt as though I belonged. Everyone was extremely friendly and always willing to answer a question or lend a helping hand. I was constantly being invited to various family and social gatherings around town, which was a great way to experience the wonderful culture there. The providers were amazing mentors, as they took me under their wing and taught me valuable medical information and life lessons every day. I was absolutely amazed at how knowledgeable and personable each of them were. Doing a rotation at IFHS was a very unique experience that no other classmate of mine was able to match. I highly suggest it to other students, regardless if you are a PA, APRN, or MD. I am very thankful for the opportunity I was given and the friends I made while I was there, and hope to go back and visit some day. My name is Tyler and I came here for four weeks in the early summer of 2013 for the Rural and Underserved Opportunities Program (R/UOP) with the University of Washington School of Medicine. Between the tremendous mentorship and welcoming nature of all the IFHS providers, my experience here will not be forgotten. Each member of the staff made a concerted effort to assist me, while allowing me ample space to learn. IFHS is quite used to having students and it shows in the way they operate. From day one, I was worked seamlessly into the patient care process. The patient population provided great opportunities to practice a wide range of skills and engage numerous cultures. The clinic itself was modern, spacious, and easy to navigate. Additionally, the clinic provided excellent housing with everything I could possibly need and a gorgeous evergreen ’99 Rav4 to drive. Before I could even think to ask, I was invited to go fishing and crabbing by staff members. I certainly hope to visit Dutch Harbor and IFHS again as I continue my medical education. Hi, my name is Margo Soppe and I am a physician assistant student from Des Moines University in Des Moines, Iowa. Last month, in March, I had the opportunity to spend 4 weeks at the Iliuliuk Clinic in Unalaska, AK. It was an absolutely wonderful experience both as a student in the clinic and well as a tourist on the island. Working as a student at the clinic was great because I was able to see patients from all over the world. The interactions were very interesting due to language barriers and cultural differences in medicine. Also, the clinic was a great opportunity to learn how to practice medicine when you don’t have specialties that are nearby or further imaging than x-ray or ultrasound. The providers and the rest of the clinic staff were a joy to work with as well. During my stay in Unalaska, I also had the opportunity to tour the island and learn a lot about the history. I was able to visit the Alyeska Fish Processing Plant and it was amazing to see how fish and crab were processed and actually ready to be shipped right from the plants. It also helped to have an idea of what many of the workers we saw in the clinic were doing on a daily basis. Another great tour was of the World War II Museum. The history of the island and how it was affected by WWII was fascinating. I was also able to hike up Ballyhoo Mountain and to the top of Bunker Hill. The view from the top of these hills was unbelievable. I visited the Russian Orthodox Church as well, which was another great piece of history from the island. All in all, I am thankful for the opportunity I had to both work in the clinic and enjoy the island life.The island community and staff of the clinic were all very welcoming and I will be encouraging future students to take advantage of the opportunity to travel to Unalaska. The staff here is incredibly knowledgeable, supportive, culinary talented and good looking- they brought me in as part of the family from day one, shared ethnic delicacies like Vietnamese coffee, and overall challenged me to be a better student. I have had the opportunity to experience many facets of family medicine as well as emergency care, procedures, lab, X-ray interpretation, laceration repair, and beyond. I genuinely feel part of the team here, being given autonomy to make decisions under supervision and have enjoyed working through challenging clinical presentations together in order to provide the best evidence based care for patients. In addition to clinic time, I’ve had a blast hiking ice capped mountains, and rock strewn tidal waters peeking at seals, otters, and bird life galore. I even made it out on the water courtesy of some of the staff and community members to drop crab pots and do some fishing. I’d also recommend bringing your trunks for a hot tub soak, salt water swimming pool and community exercise center, community events at the Burma Road House, and hanging with the radio station folks- they’ll let you go on air as DJ! All around awesome month and awesome rotation-I owe a great big hug and thank you to the wonderful staff and community. Hope to see you down the trail someday soon. The following is a synopsis of my experience as a Physician Assistant student at the IFHS clinic in Unalaska, Alaska during February of 2013. My background includes a Bachelor degree in Safety and Health Management. I worked five years in EMS along with two years as an Emergency-room Technician in Seattle, in addition to disaster response work both domestically and internationally prior to returning to school at the University of Washington’s MEDEX PA program. I spent four weeks at IFHS during the winter. The setting is incredible. Coming from Anchorage, the temperature in Dutch Harbor is strikingly mild; however the wind is consistently fierce. Mountains literally meet the sea, and Eagles and Corvids swarm the skies. While mostly known to the lay public for National Geographic’s Deadliest Catch, I personally found it a hiking mecca, and seemingly a WWII bomb shelter preserve in addition to being an industrial fishing port. The clinical experience is unique to say the least. Undoubtedly it would be difficult to find another clinical setting with such a diverse and plentiful patient population, located in such a remote setting… at least not within the United States. As the clinic serves as the only primary care and emergency care on the island, with a minimum three hour medevac flight distance to the nearest higher level of care, students at IFHS are exposed to a special approach to dealing with the question of sick or not sick. With no CT, MRI, or FAST ultrasound, and with a limited lab, decisions are based on more traditional clinical judgment, making good history taking and excellent physical exams even that much more critical. Clearly this is a great place to be exposed to remote medicine. With that said, I feel a prospective student should note this clinic is not a hospital, nor is it an Emergency Department. While emergencies certainly occur, and there is no shortage of urgent care, one should not expect this rotation to replace exposure to a typical urban ER. What the experience here will do is make you think and open your mind to how to manage patients when you don’t have the latest and greatest tools and specialists at your fingertips. Likely you can also expect to be accompanied by several youthful PAs and an NP. Furthermore, you will be surrounded by friendly and fun support staff, from RNs to EMTs to lab, x-ray, and clerical personnel. If you are looking to change things up a bit and add another perspective to your medical education, I highly recommend spending time at IFHS in Unalaska, AK. I greatly enjoyed the experience and I hope you do as well. My name is Tony. I participated in a 4 week long rotation here at the clinic in the Fall of 2012 and my experience here was top-notch. I had few expectations when I arrived, and with international mission work experience, I was not expecting such a nice and new facility. From the time my plane arrived, the staff were ready for me. I was given a tour, a “medical student” laptop for charting, a vehicle, and a very comfortable house with all of the amenities. I could not ask for the staff to be more welcoming; I was constantly invited to home-cooked meals, daily hikes, crab fishing, duck hunting, and other community activities. As for the medical experience, I could not have asked for more. On a daily basis, I experienced a wide variety of patients ranging from refills of chronic medications to knife fight wounds. All of the providers encourage student interaction and I was allowed to participate and even facilitate any procedure I felt comfortable doing. My trip to Alaska was truly life changing. I was able to do and see so much, the area is beautiful and even though you are so far from home, the staff welcomes you into their family. After my experience here, my wife and I are seriously contemplating working in this area of Alaska.